With the advent of winter, all of us, anyway, think about the transport drivers “pereobuvatsya” their cars with summer rubber in the winter, and the children transplanted with strollers, bikes, scooters and bogovalov on the sled. If you have decided to acquaint your baby with this kind of transport, the right to make a choice we will try to help in this article. Remember the incredible sense of delight and uncontrollable rush of adrenaline when fired frosty air, rolling down a snowy hill, and descended to the foot, grab your combat “horse” and then dragged him for a new portion of impressions? 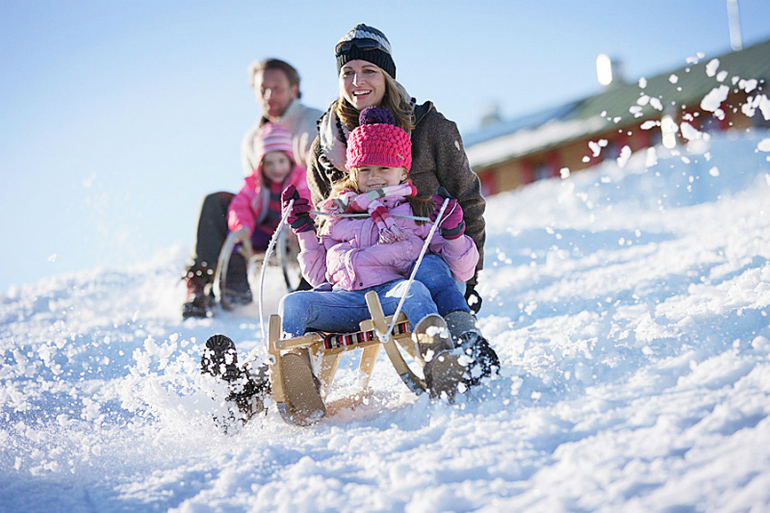 Yes, winter fun is not possible to imagine without such an attribute as a sled. And to your day of fun turned into a tragedy, let’s begin at the basic requirements for all types of sleds. First, the child should be comfortable and safe when operating this vehicle. Second, the runners should be broad and sustainable, and the product itself should have a small height, so that the rider is not overturned on turns or when braking. Thirdly, you should pay attention to the weight of the product, optimally, if it will vary between 2-6. 5 kg. So the seat is better to choose wooden or plastic – and is easier and more practical. And the latest: the sled must not have sharp corners and projections. Today, the sledge has undergone a global change so that no detailed study of this segment of the market is difficult to make a choice. 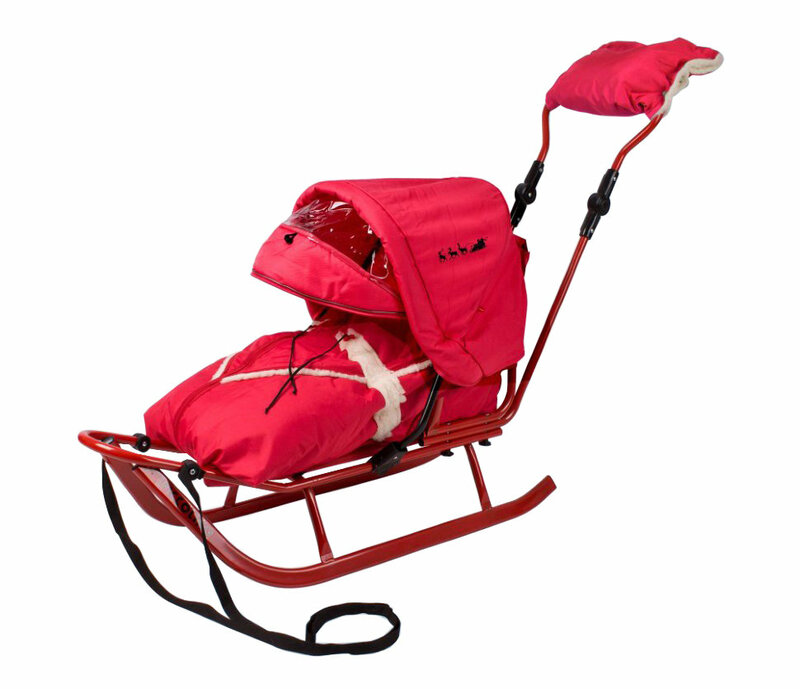 As a rule, the sled is made of three main materials: wood (pine, birch, oak), plastic and of course metal (used mainly lightweight and durable aluminum). Wooden sled it is, rather, a tribute to the classics. Yes, they are beautiful, look impressive, eco-friendly. But it is heavy, and honestly not practical for our winters, when the snow-covered road route alternates with the bare pavement. Yes, and the tree itself vulnerable to the negative effects of moisture. 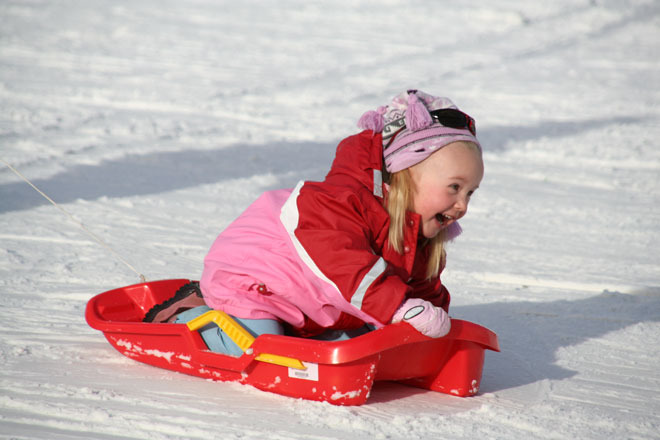 The range of plastic sled is great: sled-sled, saucers of different shapes and sizes, kick sledges, sledges-trough. They are suitable for children from 3 years. As a rule, is lightweight, has an aerodynamic design and are cast construction. 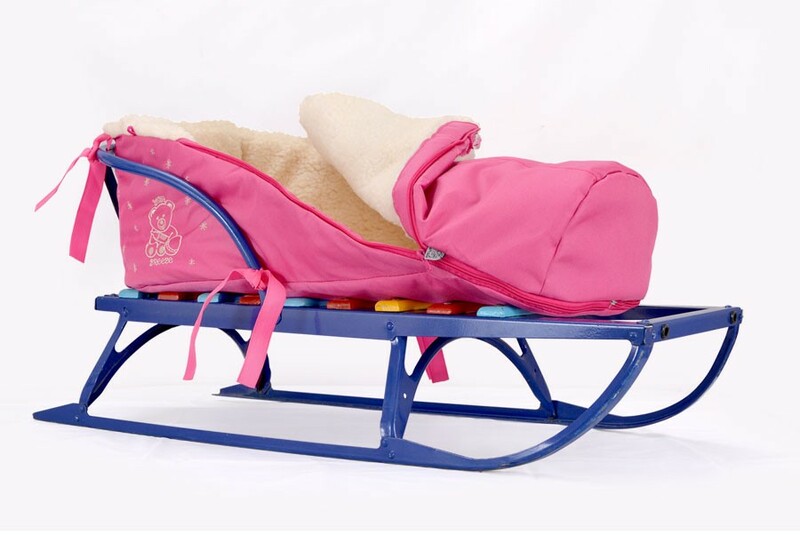 Sled-sled with a plastic base designed for babies from 6 months. They have a very stylish modern design and anatomical shape. The plastic quality is at the highest level, can withstand low temperature. Safety harness will secure the baby, and the presence of a pen-pusher will make the walk as comfortable as possible. Thanks to the folding design convenient to carry. Snow-cats can ride the baby from 3 years of age. Legs can be easily placed on skids, hands fixed on the wheel through which the kid controls the ski. Sledge-trough have-molded design, given the anatomical features of the child. Made, usually from shock proof plastic, resistant to low temperatures. Are equipped with handles-brakes that allow you to effectively manage the transport. A great choice for lovers of skiing with slides by 3 years of age. Slides presented by a wide range. Here you can find a “shovel“and “dish” made of plastic of different sizes and colors. This simple device is well dispersed and flicks. For this drive, the child must be confident to sit “on the fifth point” and be able to control your body to determine the direction of movement. The presence of a loop at slides allows you to organize train and roll down a hill. Designed for children from 5 years. 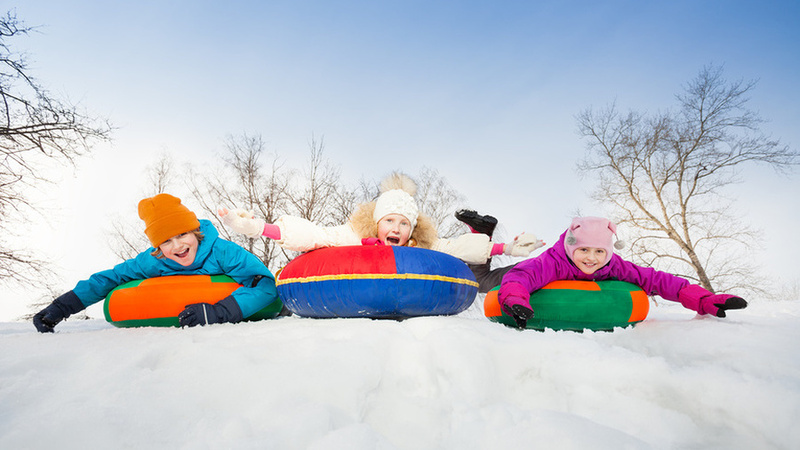 This same age group (5 years) can be attributed to the modern form of winter transport – an inflatable sled or, as they are called, cheesecakes (tube). They are light, provide a soft and fast ride, and is also extremely convenient to use and storage (blew and folded). Bonus: in the warm season you can use on the river. The material of which is made of inflatable sledge, can withstand maximum temperature. 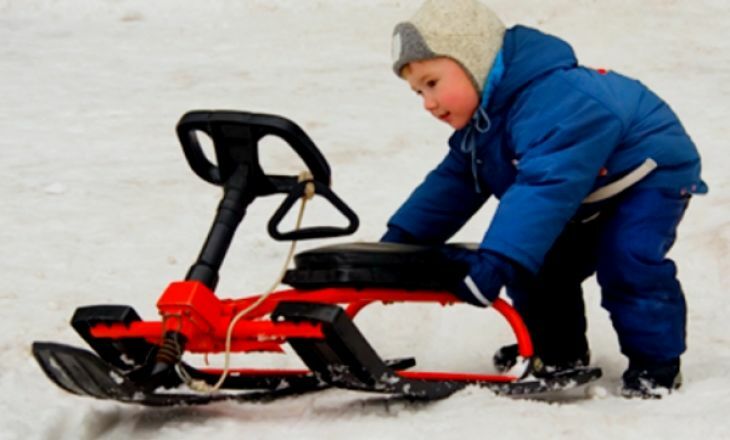 The most popular type sleds metal sled-sled, similar to those on which rode the current parents, but with their innovations and chips. Provided for children from 6 months to 6 years (you can if you want longer, because the load can withstand up to 100kg). For small riders to choose the sled you need with a small height and large width, which is necessary for the sustainability of transport. Sledge of such a plan provide baby deep planting, and the backrest supports it. For the convenience of the location of the legs is used to tripping, and for the safety of the baby can not survive, as provided by the seat belts. You securely lock the baby and enjoy the walk together. 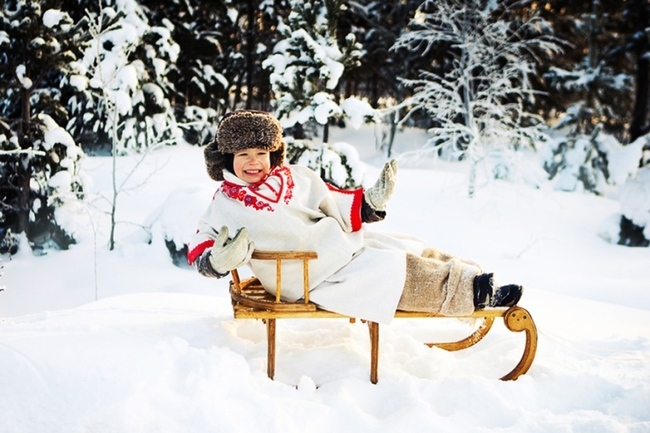 Have you ever in childhood, fall out of the sled, and the parents did not notice the “loss” as went back to the child and rolled the sled over the string (which was standard for the time)? Modern parents can be absolutely quiet, as responsible manufacturers have provided for the present Sanok pen-pusher. Now, mommy holding onto the parent handle, roll the sled in front of him, watching their child, and for more convenience you are offered the clutchto keep mom’s hands from the cold. On most sleds the pen-pusher is removable, which allows, if necessary, to move it to the other side, for example, if the wind blows or you just wanted to watch the expression on the tot, respectively, and it can go both face and back. Usually equipped with sleds for kids mattress, a seat and a warm cover for the legs. All these “chips” provide a small rider comfortable with walk, protecting from cold and as additional fixation against the loss. Another bonus could be the presence of the bonnet (or hood, visor) to protect your child from wet snow and strong winds. All the accessoriesthat add comfort and coziness in the winter stroll on a sled, whether it be a cushy envelope, Cape on foot, clutch for mom’s pens or visor weatherproof, can be purchased separately in the store. Why not come up with manufacturers upgrade to modern sleds. The children of today will not hear and not feel like metal sled “overcome” the paved sections of the road, because for these purposes they are equipped with wheels. Yes, all genius is simple! On the back of the skids are placed two wheels: if you need to pass on nezaslujenno area you just slightly tip the sled on yourself with a pen-pusher on wheels and roll them forward. There are models with 4 (and 6) wheels (semimobile), which allow not only to overcome the difficult sections of the road, but also to enter the premises, e.g. shop, without removing the child from the sled. The chassis is lowered and raised by depressing the foot lever. For easy portability and storage there are sled-transformers, which have a removable handle, backrest and armrests. Folding models are convenient because they may be kept at home, saving the place, bring in urban transport or take with you in the car. You should pay attention to the weight of the sled, the best is from 2 to 6.5 kg. If you live in a high rise building, it’s wise to choose a product with a weight up to 4 kg. For kids from 6 months to 3 years old a great alternative to a stroller will be the baby. In fact, it’s the same stroller, only distinguishing feature are the skids instead of wheels. Although there will be an amendment: sleigh-carriage may be equipped with wheels for ease of travel for not snow-covered areas. What is good about this model of sled: the ability to put a baby horizontally if he fell asleep while walking, just pushing back transport 180 degrees. This model also comes with a Cape for the legs to protect against the cold, folding Capra (hood), safety belts. Plus the fact that they have a fairly wide seat and the only drawback was the price, they will be 2 times more expensive than conventional sleds. In winter, daily use of the sled entails the care of the product. Nothing supernatural is not needed. Just keep tabs of fabric (mattress, envelope, capes, clutch), do Laundry at least once in one to two weeks. And after each use, wipe\wash skids. Store the sled in a dry form. 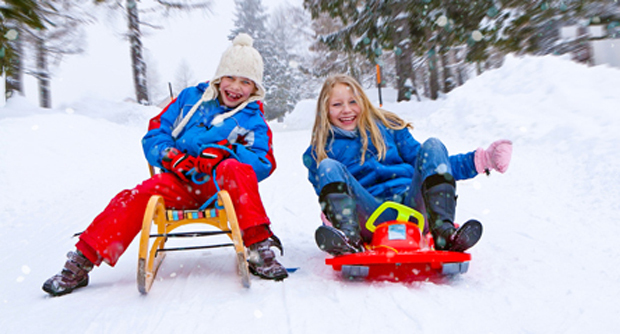 Kids who are not confident sit securely on the sled. Across the roadway to transport children in a sled ONLY in the presence of a pen-pusher and push the sled JUST in front of you. If the handle for pushing is not provided, then the child should be using the road to move on the hands. Remember that rutted road runners glide faster than on the sidewalk, so you need to be especially careful. To avoid peremerzaniya baby, use a warm envelope, a Mat or other insulation. Do not roll downhill sled, which are not provided for these purposes. Be sure to explain to the children that ride the hills near the roadway is impossible. “Prepare sledge in the summer” — says the proverb, but if you are just now addressing this issue, do not worry, there is still time. Make your choice, and that he was right, and the purchase has caused only positive emotions, you must start from two basic criteria – the age of the child and method of application (to be a walk with the baby in the cold or extreme ride on a snowy hill). We wish You success in the selection for a pleasant winter time! You are reading an article on the Winter is coming! Choose a sled for children. All materials on the site Gadgets F, а также и статья Winter is coming! 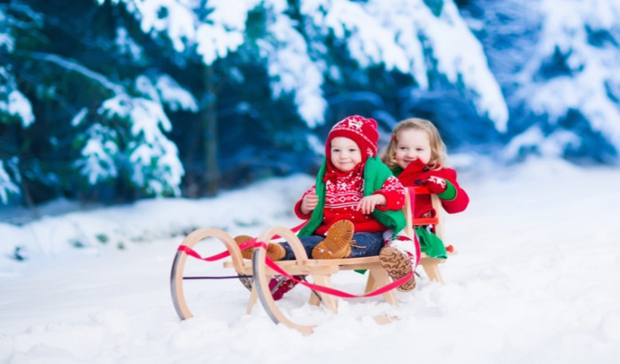 Choose a sled for children - written for the purpose of information enrichment and we are happy if you like our magazine. Samsung Galaxy S9: because of the iPhone the company will release its flagships more often?